Let’s be real: the reality of baby #3 has not totally sunk in. Only sort of. I mean, yes, I totally know that I am pregnant. And I understand that being pregnant often results in a baby. The part I’m having trouble with is imagining what our life will look like with baby #3. Perhaps I should’ve had a more solid vision of life with baby #3 before we began this process of getting pregnant. Truthfully, I have a vision of life with child #3 – although I glossed over infancy and toddlerhood in my vision. I love having two sisters and a brother. I love the gatherings we have when we get together and laugh and giggle and talk and argue and laugh some more. We are siblings and friends. The twins have a unique and wonderful bond with each other because they have never known even a minute of existence without the other. Just tonight, we were driving home and Ellie was in a fowl mood. Something about apple pies and Christmas trees really honked her off. Ellie was muttering and sobbing in her car seat for about five minutes when Carrie yelled at her. Not in an angry, “What the heck?” kind of way, but in a mocking “this is how dumb you sound” kind of way. It worked. Ellie found Carrie to be hilarious. The next ten minutes of our ride was still filled with screaming, but mixed with fits of giggles as they made each other laugh. It was why people have twins and siblings for their children. When I think of this third child, I think of road trips and family vacations and Frank tossing the kids into the pool. I think of three pairs of eyes peeking over the edge of our bed on Christmas morning, pleading with us to let them open their gifts from Santa. I think of the twins teaching this child new things and this child being a joy to them. And a pain. And an annoyance. The good and the bad… Family. When we were in the midst of this whole having babies business the first time, I could barely dare to dream that we’d have a family – much less dream of a family of five. When we decided to try to have a third baby, it seemed like less of a choice and more of a prayer that we tossed heavenward. And then we wondered. And we hoped. Last night was an outright debacle. Nothing went as planned – not even close. After a “quick” stop by Walgreens for a prescription turned into a 30 minute fiasco and I brought my sobbing children into the house a full hour after bedtime, I felt totally outnumbered. I’d put one in bed, the other one would get out. Finally, I had them both in bed and went on a quest for Jingle the Husky Pup. I returned to mass chaos. Carrie was sitting up in bed, crying and staring at Ellie. Ellie was screaming and her nose was bleeding on EVERY THING. I carried her to the bathroom and stopped the bleeding, cleaned her up, stripped her bed, made her bed, put her back into her bed and then stood in the middle of their room. They looked at me and I looked at them. I doubt I would’ve made all of the same choices that got me to the point of utter meltdown, but I also know that I can’t plan for everything. There will come a point where a similar scenario plays out. I’m glad I have six more months to get my “poop in a group” because right now, I am so not ready. Also titled: What I learned About Myself in Vegas. And What I learned About Vegas in Vegas. >>First: I am a diva. While I grew up with a family that tent camped and pop-up camped our way around the country, I found that my heart is really in the penthouse, luxury suites or other similarly outfitted high-end hotel rooms. I had an inkling about my diva ways on a few previous trips with Frank. ***Trip One: The Econo-Lodge somewhere between Chicago and Atlanta. Scene: Hotel room had been freshened up with a coat of paint. This same coat of paint was applied without consideration to everything in the room: door frames, moldings, walls, vanities and ceiling, making the experience of being in the room akin to being a stick figure drawn on a piece of paper. The bedspread was from circa 1974 and, likely, that was also the last time it was washed. I pointed to something on the floor that looked like a blood stain and decided that I didn’t want to ask “Is that a blood stain?” out loud. Sometimes, you just don’t want to know the answer. Experience: Horrific. Even though Frank had stayed at some pretty nast-tay hotel rooms in his time with a regional airline, this one was pretty epic. He dreamt the entire night of bugs coming out of his eyes, ears and mouth. Yes, this one got to him. Needless to say, we did not inquire about a continental breakfast as we ran out of the hotel bright and early in the morning. Famous Last Words: “Babe, can you believe I got this room for only $35 a night?” Yes, sweetheart, I can. ***Trip Two: A Hotel with a Guitar Shaped Pool in Nashville. Scene: Similar to the Econo-Lodge, the mosaic of stains on the carpet and the very dated bedspread were not the welcome you would hope for anywhere. Especially disconcerting were the eight missing ceiling tiles over the shower, revealing the hotel’s plumbing and the sound of our neighbor brushing his teeth. It’s like having someone else in your room… without having someone else in your room. Experience: Thank goodness we only stayed there for one night. I was barely able to zip my suitcase as I ran for the door in the morning. Knowing the hotel experiences he’s put me through in the past, Frank enthusiastically said, “NO! No deals.” I knew then that this would be a good trip. 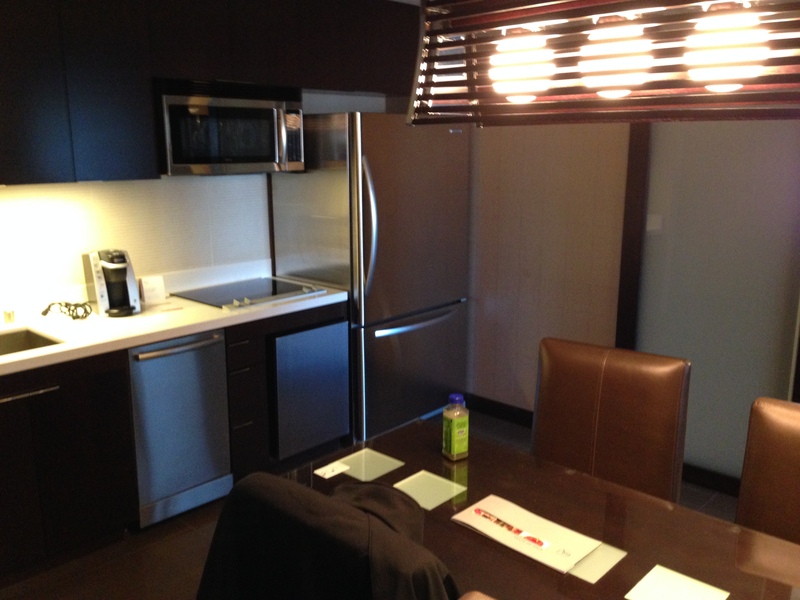 When we walked into the hotel room at Vdara in City Center, I was not disappointed. A suite, this room had a full kitchen, a family room, a bedroom and a very large bathroom. Frank, the connoisseur of mid-range hotel rooms was dually impressed and quite pleased with himself. This refrigerator is bigger than our refrigerator at home!! 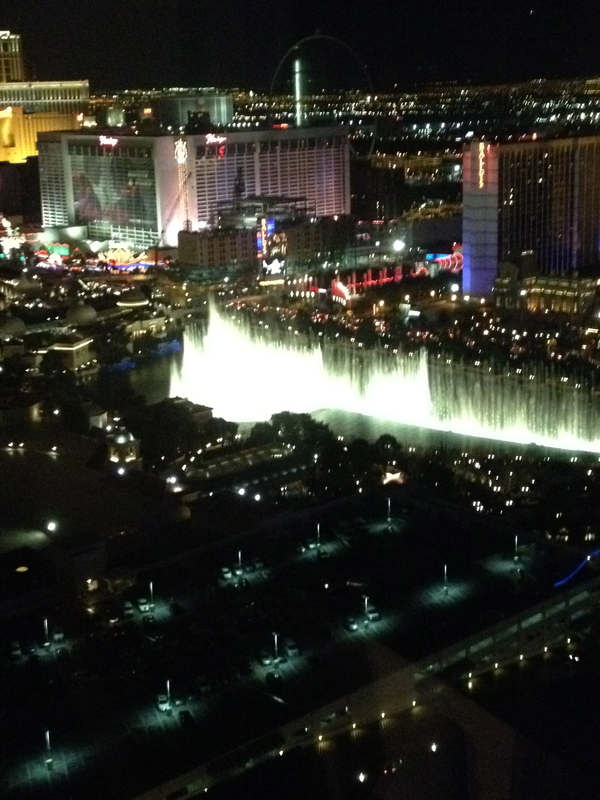 The view of the Bellagio Fountains at night from our room. Daytime view of the fountains and the strip. 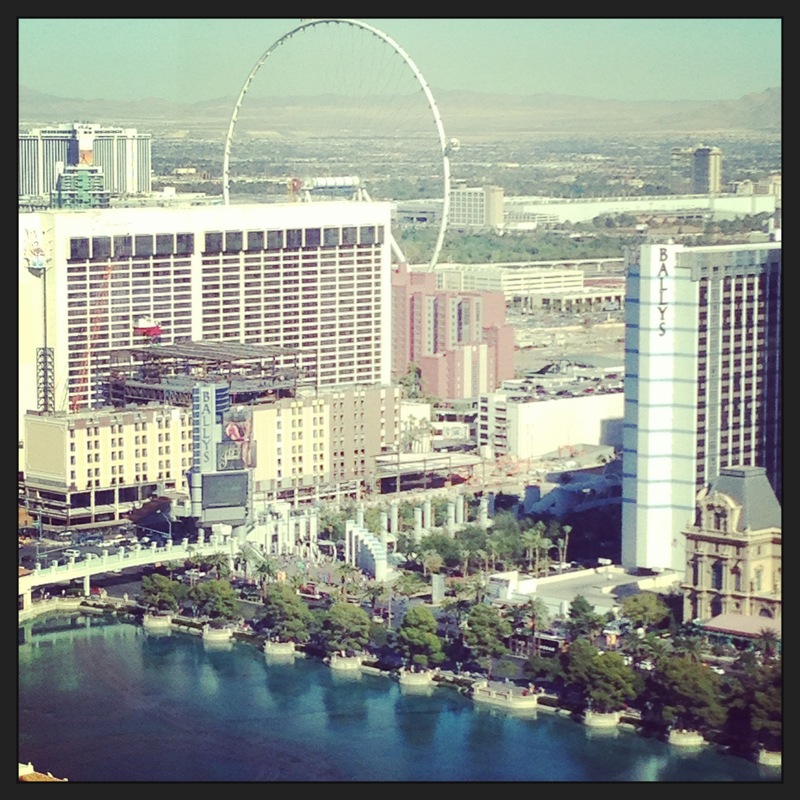 In addition to a gorgeous room, we had a gorgeous view of the Bellagio fountains, the new Ferris Wheel and the strip. I couldn’t have asked for anything better! >>Second: When Vegas is Good, it is SO GOOD. Upon arriving at the hotel, marveling at its splendor and checking out the free cable, Frank announced that we had reservations at swanky Sage in the Aria Hotel. I had read a few reviews of the restaurant online before we traveled and heard good things. I was excited! The ambiance of the restaurant is lovely. Intimate and private, we were seated at a table tucked in the corner of the restaurant. And the lighting was great: my skin looked awesome. Boom. After we ordered, the most magical thing happened: a wonderful young man arrived at our table with a tray of bread. “Tonight I have for you a bacon roll and a French baguette,” he said, showing us the still-warm bread in his tray. “May I suggest that you take one of each?” Yes, yes you can suggest that. And yes, I will take both pleaseandthankyou. The warm rolls were served with whipped butter and sea salt. The bacon roll was the perfect ratio of buttery, fluffy bread and savory, salty bacon. I should’ve asked for two of each. I am pregnant, you know. After eating the bacon roll, I was concerned that I couldn’t love the baguette nearly as much. But much like you always love your second child as much as your first, I couldn’t imagine my life without the baguette. The French would’ve been proud. Then there was the spoon. Our waiter brought out two soup bowls and nestled inside was a spoon containing the perfect bite of … something. I will never know fully what it was that I ate at that moment – except that the flavor explosions went on forever. Fresh, vibrant, colorful – it was as though I had never truly eaten before. There was also a unicorn in the restaurant and it was also magnificent. After the spoon came the bowl of creamy chestnut soup. Featuring some sort of pork happiness, currants and mushrooms and topped with the most lusciously creamy soup, every bite was an adventure in and of itself. I think Frank was also at this same dinner with me. I can’t be too sure at this point. Our main course came out with not as much fanfare as it deserved. Beautifully presented, the portions were very un-American. But the flavor? The flavor and texture was big and bold and very, very American. That bacon wrapped pork loin was likely the most delicious piece of meat I have ever eaten. Ever. Amen. Frank claims that his veal cheeks were the most delicious and tender pieces of meat he’s ever enjoyed, but at this point in the dinner I’m still not sure he was there. I only had eyes for the pork. When the waiter came back and inquired about whether we wanted dessert, we sheepishly said no. There was simply no way we possibly left room for dessert and we felt we would do the dessert a grave injustice if we attempted to eat more. While we were waiting for the check, the waiter brought out two warm shot glasses with a hot white chocolate and peppermint drink. If you could drink happiness, that’s what it tasted like. We left the restaurant content and sad. Content because of a fantastic meal. Sad because we knew that we were unlikely to find another meal in Vegas that would match Sage’s greatness that night. We just didn’t know how right we were. When Frank and I were first dating, we took in our fair share of buffets. We enjoyed the Stadium Club buffet at the United Center, the Easter buffet at the McDonald’s Lodge, a birthday buffet for Frank’s mom at the Drake in Oak Brook. These are all pretty classy buffets. I sensed that my dear husband was not acquainted with anything other than the occasional Chinese Buffet and the lovely, fancy buffets that he enjoyed growing up. Several times while we were dating, Frank mentioned wanting to go to Old Country Buffet (OCB). I couldn’t understand – I had been to several similar buffets growing up and never really enjoyed them for anything more than their soft serve ice cream with sprinkles. I’m a simple girl, really. After hearing him talk about the magic that must be the OCB several times, I gave in and we went to an OCB. Frank’s excitement was palpable as we walked up to the door – and I watched that excitement drain from his being as we checked into the restaurant and surveyed its offerings. Fruit flies, overcooked chicken, fake mashed potatoes, limp looking vegetables… the scene was food devastation. Frank filled up a plate, refusing to acknowledge the food horrors in front of him. That sad disappointment still lingers on Frank’s face when we pass an OCB to this day. You can practically hear the strains of “What Might Have Been” faintly playing in the background as we cruise by. “We can’t go back again… there’s no use giving in… and there’s no way to know, what might have been.” Godspeed, OCB. Godspeed. I wasn’t thinking about OCB when we booked tickets to see Million Dollar Quartet at Harrah’s Casino. Vegas buffets are legendary – I didn’t think you could go wrong. Oh… But you can go wrong. So wrong. Harrah’s Casino in Las Vegas more closely resembles several football fields of bad man cave poker tables gone wrong than a Las Vegas Casino. The casino feels like swimming through stale beer and a haze of old cigar smoke. It feels like time marched on and trampled the casino underfoot. I ignored that voice. The buffet was free. It was included with our show tickets. I should’ve heeded her warning. As we waited to be let into the buffet, the greeter handed Frank and I oversized utensils. I realized they were going to take pictures of us with these utensils. It had the ominous feeling of a “before” photo in the making. I held the fork, he held the spoon. For the first picture, we smiled. For the second picture, the greeter encouraged us to pretend to hit each other with our utensils. If that isn’t foreshadowing, I don’t know what is. We walked the buffet, trying to figure out what looked delicious and determine our strategy for best navigating this buffet. I quickly found that nothing looked good. After a few sad perusals, I was happy to see some Mexican food at one end, so I went over to sample that. I figured, how can you mess up Mexican food? After lifting the lids off of several pots, I decided to just have three corn tortillas, some cheese and a small smattering of a meat product. I added mashed potatoes and some over-dried turkey to my plate and called that dinner. As always, Frank returned from the buffet with a full plate. I nibbled the tortillas, dumping the questionable meat on the plate. I ate the mashed potatoes. I couldn’t bring myself to approach the turkey. I decided to take the cashier’s advice and hit up the dessert area, hoping for better results. I had a small cupcake and cookie. Meanwhile, Frank cleared most of his plate. “I mean, it’s not great,” he said, pushing his mostly empty plate away. The punchline to this joke of a buffet? Frank slept soundly while I sat on the floor of the bathroom in our hotel room puking. Frank 1. Emily -2. >>Fourth: In Vegas Old is Old. In sweet, quaint midwestern towns, old becomes quaint. Grandmas in sweater sets and polyester pants are cute, even when they are stealing cookies at the buffet. Grandpas wearing plaid pants and faded sport coats are sweet, even when they make strange remarks and wink at you. I expected in Vegas that the older parts of the strip would be quaint in much the same way. I hoped that it would feel like the ghosts of Sinatra or Bob Hope or other famous old dudes might still be hanging around, throwing dice at the Craps tables. Alas, that was not the case. In Vegas, Grandmas don cocktail dresses and Naturalizers and it’s not a good scene. We went to the old school Tropicana Hotel to see the Laugh Factory. The first thing to know about casinos in Vegas is that they allow smoking. The second thing to know is that the newer casinos have much more effective air filtration systems. The older hotels smell and feel like the inside of an old bowling shoe: smokey, musty with a faint hint of Lysol. If the ghosts of Sinatra or Hope or anyone else were hanging around in old Vegas casinos, I was not about to find out. 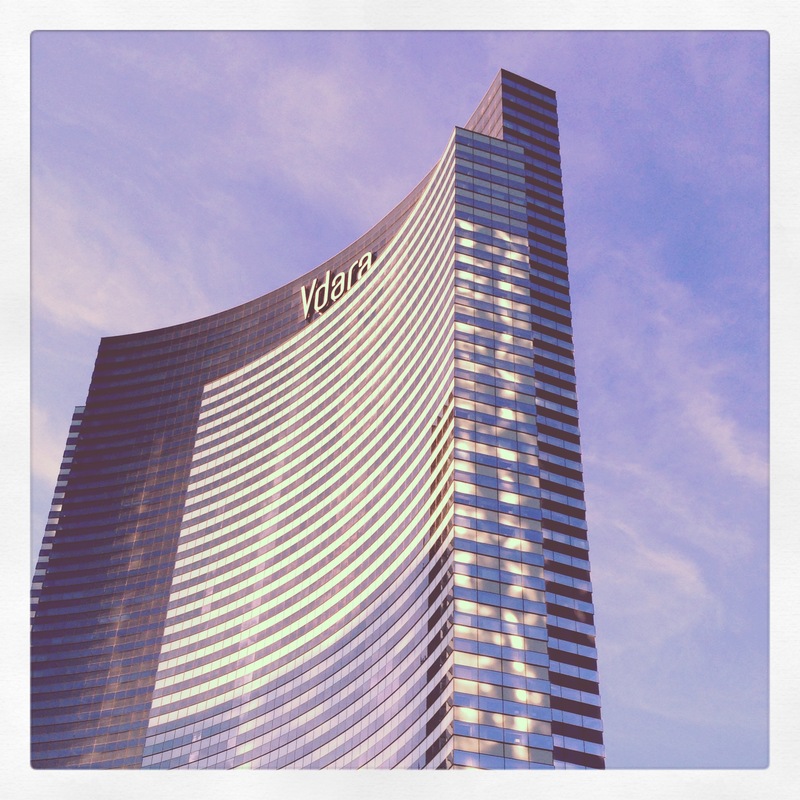 I am a diva, after all, and I preferred the shiny new Vdara/Aria/Mandarin to the old strip. Before the debacle at Harrah’s, Frank and I went on a mission to find a place to have delicious cocktails and appetizers prior to dinner. Frank was pretty insistent on getting over to the Mandarin Oriental. 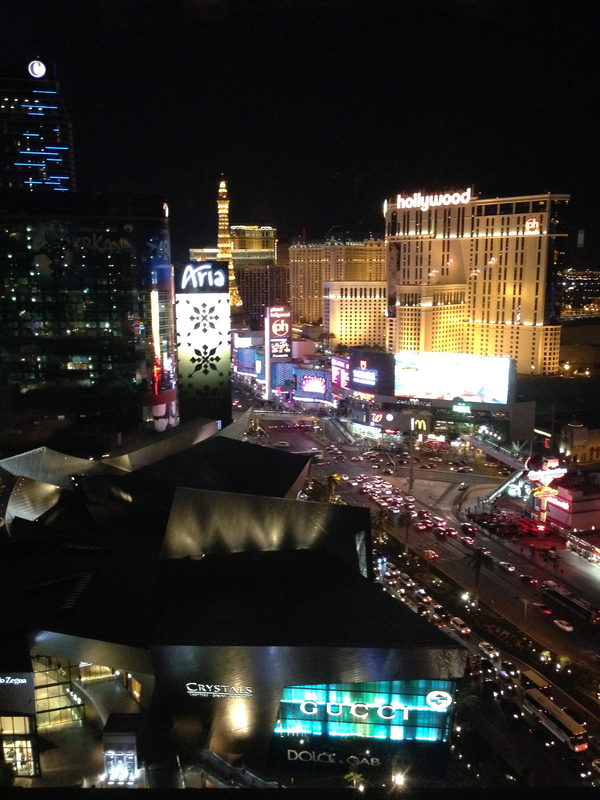 The view of the strip from the Mandarin Oriental. We enjoyed this front-row view to the twinkly lights of Vegas from a plush couch while sipping our drinks (tea for me, a cocktail for Frank) and noshing on calamari. It was truly a highlight for both of us. I didn’t love Vegas before we left on our trip. I’m not a Vegas girl. When presented with an opportunity to go on a trip, I suggested Vegas because I knew they had wonderful restaurants, a few good shows and I was hopeful we would find a hotel with a decent bed. With twins and work and being pregnant, sleep is a precious commodity! I still don’t love Vegas after our trip. But I did love spending time with Frank, eating great food, seeing entertaining shows, and wandering through overpriced designer stores and marveling at $5,000 red high heeled shoes. At that price range, the stores are more like museums displaying fine art than actual retail establishments, as far as I am concerned. I spoke to a few local Vegasians. I asked them what they liked about their town. Universally, they loved the food and entertainment. Our cab driver from Sweden raved about the seafood at the buffets. But they all cautioned about gambling in a way that suggested that they knew people personally who had fallen into the gambling black hole, never to return again. Oh, how you’re missing out. I loved the 1989 movie Parenthood. I would categorize it as a movie that I loved when it came out (I was nine) and love even more now that I’m a parent – especially since I get the jokes (which, side note, OMG – why was I allowed to watch this movie when I was 9??). In the theme of the movie, here are updates on the recent happenings in the K Family… in no particular order. Justin(3 year old son): Who’s that? Gil (Dad): It’s my kid brother, Larry, your uncle. Don’t give him any money. Oh, dear, sweet, young Emily. You are as relevant and as cool at 32 as you were at 21. That’s not saying much, but it’s OK. Have a cocktail, toast your sister and color your roots. I mean seriously, is that fairy dust or sparkly grays? Karen: I happen to LIKE the roller coaster, okay? As far as I’m concerned, your grandmother is brilliant. Gil: Yeah if she’s so brilliant why is she sitting in our NEIGHBOR’S CAR? We live on a roller coaster. Frank is home, Frank is gone. Some of the hills and loops are familiar – kids to sitter, kids to doctor, kids home, go to work, leave lunch on the counter at home. Some of the twists are new – new projects, opportunities, moving homes, and so on. I love our roller coaster. I love that there is an element of juggling involved in our lives and I love when everything goes smoothly. Our roller coaster makes me appreciate quiet Saturday nights like this one, where I can spend some time writing. I used to think I was a merry-go-round kinda girl at my core. Until there was Frank; Frank makes the ride worth it and taught me how to love the roller coaster. After ten years of marriage on September 19, I’d pick the roller coaster every time. T M, A.
Frank (Dad): You know, when you were two years old, we thought you had polio. Did you know that? Gil (Son): Yeah, Mom said… something about it a couple of years ago. Frank: Yeah, well, for a week we didn’t know. I hated you for that. Frank: I did. I hated having to care, having to go through the pain, the hurt, the suffering. It’s not for me. One of the hardest parts of parenting is not what you have to do for your children – it’s learning to accept what you can’t do for your children. We do our best to set a good framework, provide rules and boundaries – but every now and then something crops up and they are the only ones who can handle it. We are rapidly hitting these moments – potty training, going to play school (Pre-pre-school, essentially), and generally redirecting them when they are misbehaving. Parenting is an art and a science and a test in parental patience, will-power and self-discipline. But it is so worth it. The girls make jokes now – with each other and with us. The play together so nicely much of the time and I am surprised by the few times they need a parent to step in and break up a disagreement. Ellie is a gentle soul with alpha baby tendencies. She does not like stern reprimands and apologizes almost to the point of fault. She will certainly stand up to her sister and has mastered the screeching scream as a method to scare Carrigan away from a beloved stuffed animal or toy. I wasn’t feeling well the other day and Ellie was persistent in her questioning, “Mom, are you OK? Do you need medicine? Do you need to see the doc-tor?” She asked these questions with her curly red head cocked to one side and her eyebrows raised in serious concern. Carrie is hilarious and gregarious. We were getting ice cream – her favorite treat – and she walked into the ice cream store like she owned it. She said hello to everyone, investigated the toppings and ice cream selections, requesting sprinkles like an old pro. And that’s the way she is – she walks into a room and says, “Hello friends! How’s it going?” with a big, confident smile on her face. She has started striking poses with one hand on her hip – which is incredibly funny! She has a sensitive side that is tough to navigate; she will throw up a wall if she wants to ignore your request and is genuinely sorry when she’s done wrong. Frank: Gil, you have a good memory. Uh, was it yours or Helen’s or Susan’s wedding I got drunk at? Gil: It was all three, Dad. Congratulations. Frank: Well, which one did I punch the band leader? Gil: That was mine. We have photos. I’m having them blown up for the commitment hearings. I am constantly re-learning the meaning of family. It’s a lesson that evolves and morphs and changes, but the result is always the same for me: family is both the people I was born stuck with and the people I choose to be stuck with. Family is always worth the time and the fight and the energy. Words give shape to this life, to feelings, to experiences. I remember going through the end of a relationship, and just deciding that it was just a “thing” that happened and one minute it existed and the next it was gone. So, I didn’t put many words around that grief. I didn’t give it shape – meaning – purpose – I just sort of let it ooze and leak and evaporate away. I shrugged it off. In stark contrast, when Frank and I started dating, we could not use enough WORDS. We wrote each other letters and emails and text messages. I saved those text messages as long as I could until I changed cellphone providers one too many times and the texts were gone. Every moment of our relationship was (and still is) painted in words. Love, hope, happiness, expectation, dreams – all carefully spoken and written and envisioned. Still, with all of these words, there are still memories that feel like vapor – moving through me with all of the emotion and feeling of the moments they represent – and then vanishing when I try to inspect them. This weekend. Church. Familiar words of a song, ripped from the same Bible verses as another song. A light, happy mood coupled with the weight of the week hanging in the background triggered a memory and a moment from fifteen years ago. Driving – the ultimate teenage freedom – in an old, blue jeep. It didn’t matter what the car looked like, as long as there was gas and a working radio. Wherever. Movies, parks, festivals. Whatever. A nagging sense that these moments were fleeting. A quickly squashed thought: we won’t be young forever. Friends. Singing. Warm air through the windows. A mid-summer sun sifting through the clouds on the western horizon. If time was money, we were millionaires without a wallet. And just like the many mornings I wake up to tell Frank of my dreams, the words don’t come fast enough and the end results are just vague meanderings without any of the important elements of the story. Idyllic suburban setting. Typical teenage experience. Yawn. But… it was so much more. It was my life. Like water through my fingers, those days are gone and I find myself wishing the words would come faster so that I could wrap myself around them, but instead I am sucking ether. And so here I am tonight. My children are escape artists with no interest in sleeping. Specifically, Carrie is amused by her own agility at leaping out of her crib, pleased with herself that she no longer bangs her face on the crib railing during the descent. On the third time I’ve gone up the stairs, turned left and looked to their room, I find myself stifling a laugh. Carrie has quickly shut the door, but is hanging on to the handle for dear life. From outside of the room, the lever door handle is angled peculiarly in the down position. She must know that this is the third time and this time I will not rock her in the chair and call her my angel and smell her straight light brown/dark blond hair. She must know that this time, I must.not.laugh because I must be MOM. A force of gentle justice at bedtime. The woman who knows better. But for a few seconds, looking at that door handle, I am two years old. I am her peer. I know the adrenaline running through her as she waits for me to find her on the other side of the door – out of her bed – again. I know this because that was me once. It takes a hiccup of time- for me to swallow the giggle and remind myself that to cave is to create a child who will.never.sleep. I open the door, swoop her into my arms and place her firmly into her crib. She knows. I know. We cannot make eye contact or we will break the fourth wall. If we do, we will be forced to acknowledge that I am a child, a teenager, an irresponsible college student, who somehow is a mother. Someone has to be in charge, here. It’s me. When I finally leave her room, letting the door softly click behind me, I think – will I remember this? Are mountains made of these quickly forgotten moments? OK, so I’m totally on a writing frenzy, so I’m going with it. A few days ago my girlfriend from high school sent me a note that I wrote with her when we were seniors. It was a list of things that I hoped I’d do with my life and the characteristics of the man I’d hoped I’d marry. And I appreciate that. I really do. But here are three reasons why my high school experience was more awkward than yours. Winner, winner, chicken dinner. Right here. Bam. I wear a size 12 shoe. When I was in high school, it was horrific trying to find a cute pair of size 12 shoes that looked like something that a high school student would wear. Remember, I was in high school in the era of the movie Clueless. Flannel grunge was on the way out and cute little Mary Jane shoes and strappy sandals were in. Cue me: a giant girl wearing beige suede naturalizer lace up shoes. For real. This happened. And I was GRATEFUL for those shoes. Compared to what was available to me, these shoes were downright smokin’ hot. Nevermind that a 90 year old grandma sashayed out of the store with the same.exact.pair. Mad props to my mom because that woman HATES shopping – passionately – and she felt so bad about my shoe situation that she tracked down a small boutique shoe store that specialized in weird shoe sizes and bought me whatever she could find. When the internets came around, but before shopping online was hip, she would track down bizarre shoe catalogs in hopes of finding a new resource for shoes. That is how sad and tragic my shoe situation was. And awkward. You guys, and I cannot make this up, I chipped my tooth taking my cello out of its case. Yes, you read that right. It happened. I had emergency dental work due to an ORCHESTRA injury. I broke my foot taking a lead-off from a base during one of the first softball games of the season. I also got my tongue stuck in my braces. Who does that? Me. No one else. Just me. My shoe situation definitely deserved its own horrific category. But, man a live, if you saw what was coming at you down the band hall from the ankles up, you would’ve been very concerned. First, you would’ve likely noticed the color of my socks. No. There was just a three inch gap between my sweet naturalizer kicks and the hem of my jeans. And oh, my jeans. MY JEANS! My sister and I spent more than one occasion hugging and crying in Kohls due to a lack of long jeans. When your choice is between four inches of ankle showing and three inches of ankle showing, you sort of don’t notice the elastic waistband at the top, holding the whole hot mess together. Yes, I am trying to tell you that I wore elastic waistband jeans for like, three or four years. It wasn’t pretty. So when I say that I had a vivid picture of the me in high school, writing the me today a letter about my hopes and dreams, I cannot help but cringe at the whole… ensemble. 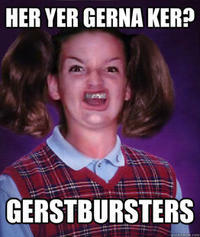 It’s no wonder I feel a kinship with the ermahgerd meme. It hits just a little to close to home. My high school picture. Almost. Ten years ago this month, Frank and I enjoyed our first Valentines Day as a couple. No, for real. Frank had a test flight in a multi-engine plane and there was an issue with the cowling (skin) of the plane. As they were taking off, the cowling came loose and was dangerously close to taking out one of the engines. Yada yada yada… They safely landed and Frank came over to my parents home, made me a delicious dinner and continued his tireless pursuit of my affection. The next day, Frank and I had a meeting with our pastor to talk about our relationship – resulting in Frank’s second near death experience in less than 24 hours. Unexpectedly for Frank, our Pastor suggested (oh em gee!!) that we get married. A few hours later, after recovering from nearly passing out, Frank decided that (and this is a direct quote) he was “as ready as I’ll ever be” to get married. Which, to me, either meant he was committed to a life of bachelorhood or he was ready to lock this relationship down. Fortunately for his sister (he was “crashing” with her for 18 months), he meant the second option. I find my heart racing when I think of how these years have slipped by. We have filled the time – and while I’d like to think we’ve filled the time well – the slippery, fluid nature of time consumes the background of my consciousness. I think of the things I’ve already forgotten. Memories filed carelessly in “misc” that only come back to me when enjoying time with old friends. And I think of the things I’ll never forget – singing 3rd Eye Blind with Kate and Jamie while driving in Kate’s Bonneville – the lyrics to “Long December” because that song became my anthem when I got my drivers license – the first time I met Frank – driving in The Blue Ox with the irreplaceable JLN – seeing my babies for the first time – how my mom smelled when she came home from a fun night with friends – the sound of my dads car cruising into to garage after a long day at work. Time marches on in only one direction. Something about entropy and other physics shenanigans. Much smarter people than me are far more fit for that concept. I love time travel stories. I’ve loved them since I was a young girl and my dad read “The Time Machine” to me. I love the idea of moving through time the way we move through space. If given the opportunity to go back and change something, I don’t believe I would. There is something pure and authentic and genuine about our “one wild and precious life” – and living it as such. The beauty of writing and blogging is that I do have an opportunity to write into the future – to send myself and my husband and my children a sort of message in a bottle. A way for them to know me now, without the benefit of a time machine. Next month is my ten year anniversary of blogging. While it started out as the musings of a young 22 year old me who spent more time contemplating area malls, calories in salads and Diet Coke preferences, I hope that it has become for my children and my husband an illustration of me becoming myself – and the mother and wife they will remember. This life that I am living – it is my love song for them.